Easy salmon chowder that`s low carb, economical and delicious! 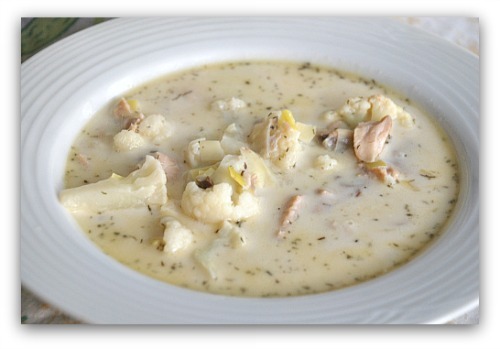 This salmon chowder uses cauliflower to replace the traditional potatoes found in many chowders. The dill enhances the flavor of the salmon. And the cauliflower loses it's cabbage-like flavor. Reduce the cream by simmering in a small saucepan over medium/low heat. Whisk from time to time until reduced to 2/3 cup. In a soup pot, melt the butter and add the leeks and wine and the garlic. Cook gently over medium heat. The leeks should be tender but not browned and most of the moisture evaporated. Add 2-12 cups chicken stock, juice from the salmon tins, dill and the cauliflower. Season with salt. Bring to a boil and then reduce the heat. Simmer, uncovered until the cauliflower is tender, about 10-15 minutes. Turn the heat down to low and stir in the reduced cream. Break up the salmon meat in chunks and add to the soup. Simmer gently until the salmon is heated through, about 10 minutes. Add the freshly ground pepper. Ladle into 4 serving bowls and enjoy! I used the canned salmon but you could also put in a boneless, skinless salmon fillet that's about 12 ounces. Be sure to cook it through for about 10 minutes. Then break the fish up into chunks with your ladle. As far as salmon chowders go, this one is very economical especially when cauliflower is in season. I love it's chunkiness and how the cauliflower adds a little texture along with the smooth creamy soup base. It makes a very satisfying lunch by itself. I found it very filling and I didn't have any hunger pangs until supper time. That's always a good sign. It means my blood sugar remained stable. If you love chowders, I do have a recipe for a clam chowder as well. It`s a little higher in carbohydrates because clams do have carbs while salmon does not. Plus there are a few more vegetables in the soup which will also add up. It`s very good so check it out. OK, let`s leave the Salmon Chowder page and go back to the Home page.